At this time of year, there are so many (not necessarily unwelcome, mind you) opportunities to eat heavy, cheesy, creamy, calorie-loaded foods that I’m more than happy to take a break from all that and make something hearty and satisfying that still somehow manages to feel light. In a stock pot, saute the shallot, onion, and pepper over medium heat in the olive oil until the onion is translucent. Add the garlic and stir until fragrant. Add the lemon, chick peas, saffron, and chicken or vegetable broth, bring to a boil, and reduce heat and simmer, covered, for about 20 minutes. With an immersion blender (stick blender), very roughly puree the soup to achieve a thick texture. Add the oregano, thyme, and olives, simmering for another 10 minutes. 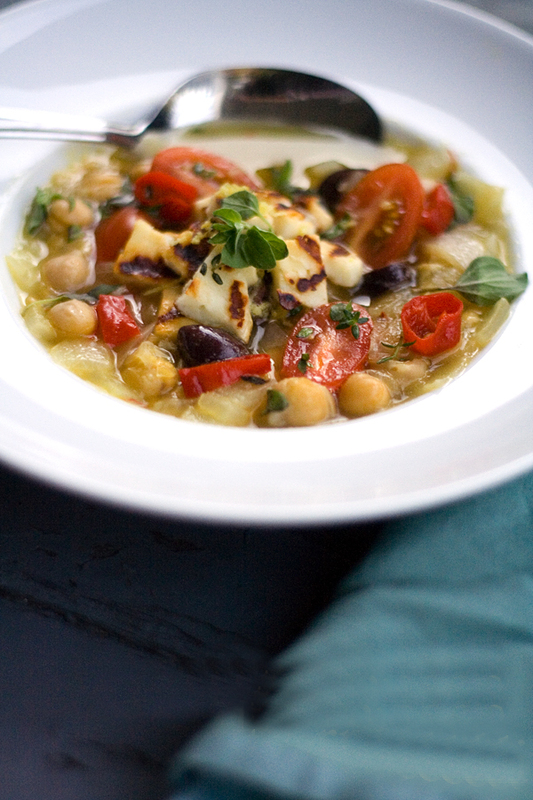 During this time grill the haloumi slices and then chop them into small “croutons.” Add the grape tomatoes and cook until slightly mushy. Salt and pepper to taste – but be careful with the salt, as the haloumi will add a salty component. 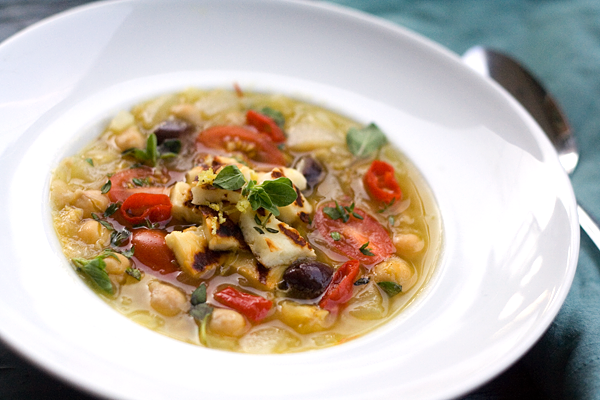 To serve, ladle the soup into bowls and top with the picked peppers, haloumi, and a dusting of the lemon zest. The nutty chickpeas and delicate saffron scented broth worked really well with the salty cheese and gentle heat from the peppers. A keeper! One note about the original version – while I think feta would add a great flavor to this dish, I enjoyed the crispy crunch of the fried haloumi so much that it makes me wonder if the feta wouldn’t provide enough textural contrast. Only one way to find out – I’ll just have to make it again and see!